← Culturae Mundi Wants You! 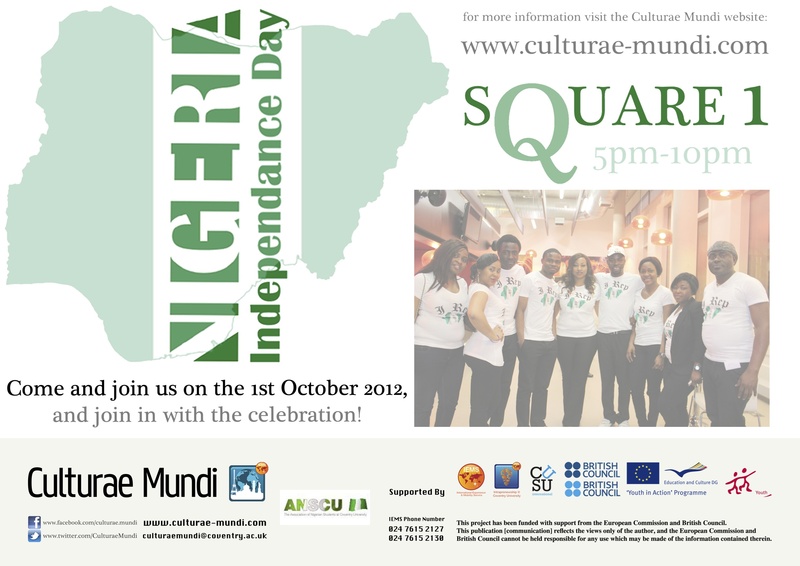 Culturae Mundi will be kicking off the year with a charged celebration of Nigeria’s Independence Day on October 1st! Set up by Coventry University’s very own global cultures organisation, known as the previously mentioned Culturae Mundi, Nigerian Day promises to host a great array of happenings from music and dance to readings of Nigerian folk poems. You can also expect lots of great food and drink and certainly great company and activity. For not only a cultivating experience but for an incredibly entertaining one, do join us, Monday the first in Square One here at Cov Uni. The event starts at 5 pm. Don’t miss it!